Kissing Crane Pearl Pocket Farmer Pocket Knife | BUDK.com - Knives & Swords At The Lowest Prices! 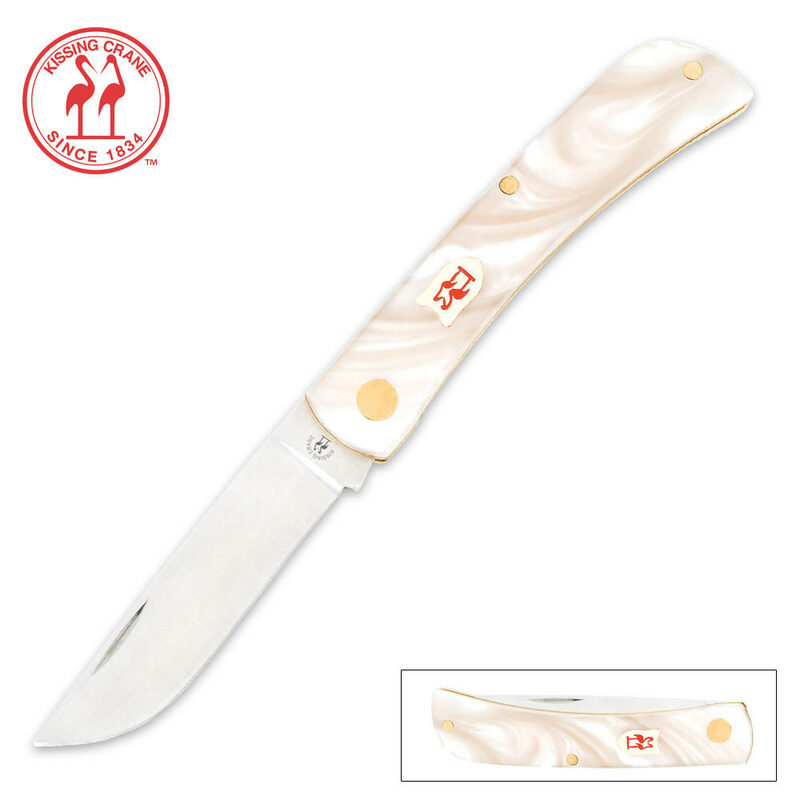 This unique new design from Kissing Crane features a stainless steel blade, brass bolsters and a handle made of beautiful imitation pearl. An elegant addition to any collection, it's 3 5/8" closed. I just now received this and I am MORE than pleased with it! It's beautiful, almost to beautiful to use, but I'm gonna use it so I can show it off. Solid little pocket knife, nice thickness to the blade and handle, easy and comfortable to grip. Perfect size and weight, not too big or heavy for your pocket. Extremely well made and sturdy feel to it, no blade wobble, nice and snug. I'm sure this knife is going perform and serve me well. 5 stars all the way!! This is basically a sodbuster Jr and for the price ts well worth it. Opens perfect and is well made. It's almost made better than my $50 case sodbuster Jr and its only $12? I will surely buy the rest of the designs. Thanks budk! Nice looking knife!. The only part i disliked about mine was the small imperfections on the handle like a tiny pit in the handle material and deep scratches in the handle. I still give 5 stars for the knife itself. they are good knife and they keep good edge,and they stay sharp for long time. These are fine working knives regardless of the handle material. They take a good edge and are good looking too. Very similar to the Case Sod Buster Jr. Which is also a fine working knife. I bought a pair of these, one in black and the other in pearl. Both are great small working knives. They look great , but don't cost much. So you can use them and buy another if you break or lose one. BudK also sells the Kissing Crane Medium Brown Mule. Same style , but larger and with wood scales. All three are great buys. The second Kissing Crane knife I have orderded from BudK.I wish they would include Country of Manufacture on every knife they sell. Both KC's have been made in China. The KC knives are sweet, sharp & very well made ! This particular Co. in China is Superior. Try one & Buy one. Under $10.00 US ! Bought 2 at $6.98 ea. and both are very well made. I have bought a number of knifes from budk this one is in the top 10, tight, all edges are well finished, all and all a beautiful knife for the price. ~ Great for cutting that apple at work. Got this knife as a small pocket knife for daily use. It is a great size and is well made especially for the price.